Tuesday night Charlie “Steelhead” Brown, told me he was going fishing all day Wednesday and camping out and fishing Thursday too, since the weather was nice and his wife was busy with work. We met up at the boat ramp Wednesday morning around 730am and there was already a bunch of boats in the water. Not many bankies though, so we were able to run our plugs through chief hole pretty good. We were sitting plugging away in the middle of the hole, when a boat fishing bait at the top hooked one and the fish ran down past our boat. So we had to bring the rods in, after i got the first one in we looked at the other rod and we had a fish on our self’s! They were fighting the fish like it was a monster floating all the way down the hole, we achored up the boat and landed the fish real quick i think they even saw us do it really quick. 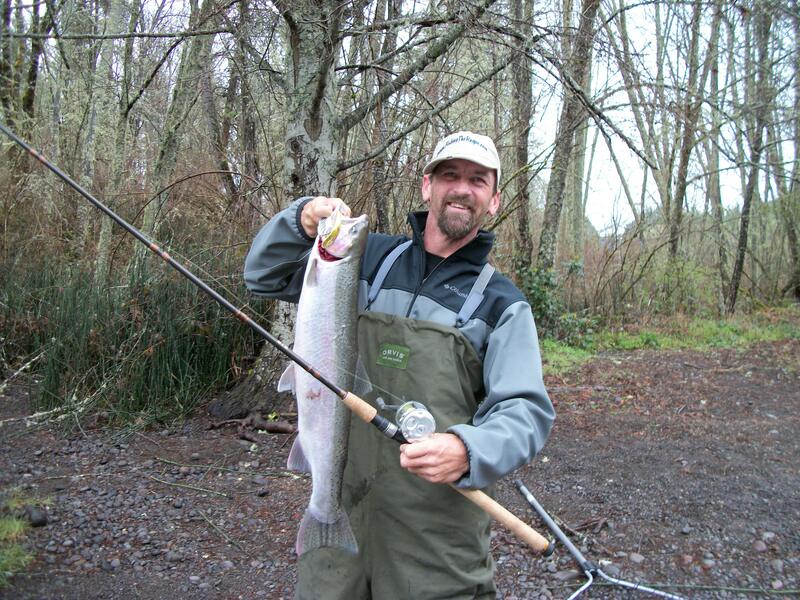 The fish ended up being a real nice chrome hatchery hen, 7lbs. We took our time fishing the holes after we got that fish in the boat. We did this because we couldnt shuttle back up to the top and also since so many boats were on the river the holes were beat to death. We made it down to Casey Park only a hole or two above where Charlie planned on camping for the night. Quite a few bankies were fishing here its a pretty popular spot. But we still managed to pull one out on plugs!!! 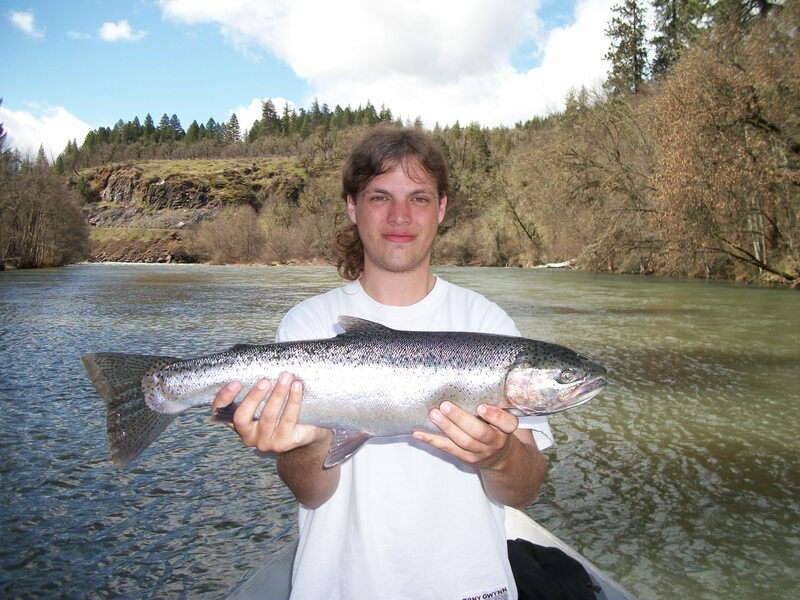 This one was a real beautiful fish, and it was another hatchery hen, so charlie got himself some more bait! And i got my limit by 2pm. Was an awesome day on the water as you can see. Fishing in a boat with a great guide, wearing a tee shirt and limiting out by 2pm. It dont get much better! I was walking back to my car and the ex police chief of Shady Cove actually gave me a ride to my car. Lots of nice people out here in the great state of Oregon. Ill leave you guy’s wit one last picture from this day. I was leaving and stopped off at the top of the slide hole and see Charlie at the bottom. I shouted to him and took his picture. He shouted back that he had just released a nice buck that he caught on roe! Make sure you check out Charlies site. FishingTheRogue.com. If you book a trip with him make sure you mention my name and or my blog. And you will get a really great discount! Well thanks for reading! and Tight Lines to all! This entry was posted on April 1, 2011 by blazer_shane. 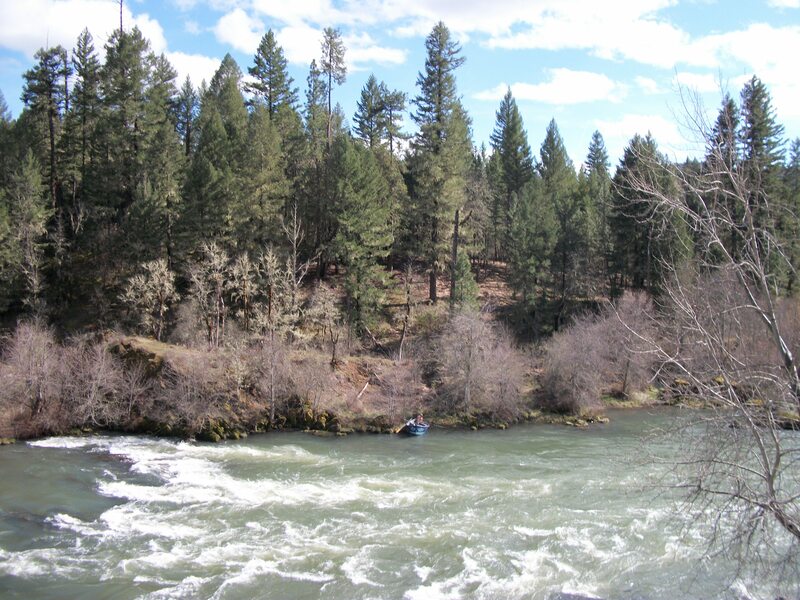 It was filed under Rogue River, Uncategorized and was tagged with Fishing, limit, Oregon, plugs, Rogue River, steelhead. Oh, yeah. Tough to beat a day like that. 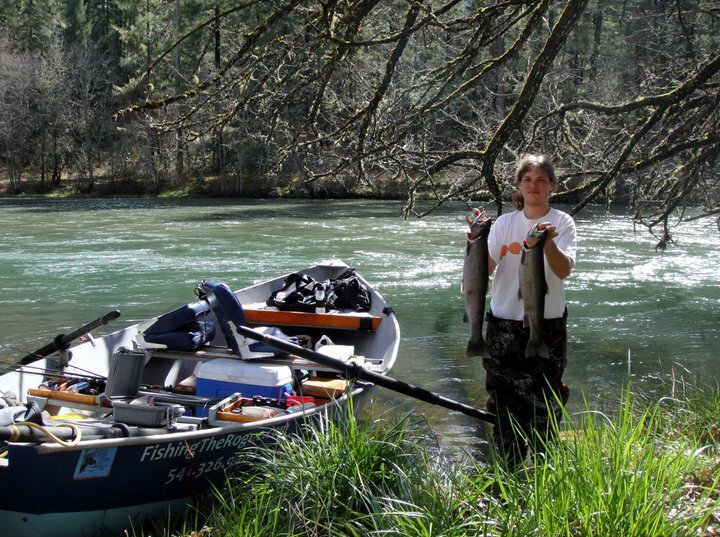 You are doing really well in your Steelhead adventures. I really enjoy trout river fishing, just me the rod and some gorgeous trout.